He has spent years shrinking away from the limelight and at school his nickname was 'titch' because he was so tiny. 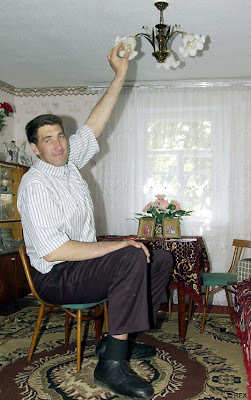 But Ukrainian Leonid Stadnyk has now officially become the world's tallest man standing at a towering 8ft 5ins in tall. 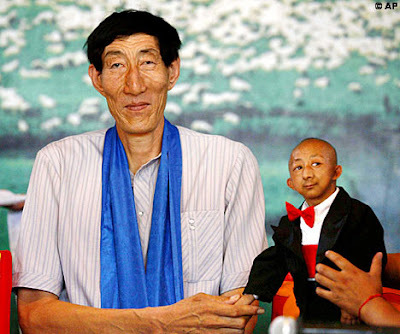 Measuring an impressive 8ins taller than the previous record holder, Mongolia's Bao Xishun, it has long been suspected that Stadnyk should hold the official title of the world's tallest man. But until now the 37-year-old former veterinarian has always refused to be officially measured for the Guinness Book of Records as he hates his height and didn't want to be famous. 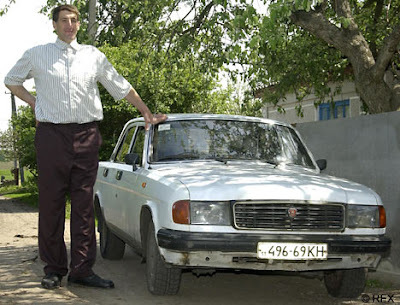 The towering giant who lives in Podoliantsi, a tiny village in Ukraine has called his height 'God's biggest punishment for me' and refuses to look in the mirror. His extraordinary growth spurt started at the age of 14 after surgery on a benign brain tumour stimulated his pituitary gland, which is responsible for generating the hormones that boost growth. How many tall men does it take to change a light bulb? Previously at school, the Ukrainian was one of the smallest boys in his class and he used to be known to fellow pupils as 'titch'. But his condition known as acromegalic gigantism, saw him grow so fast that suit trousers which once fitted him perfectly were 12 inches too short within two years. He now sleeps on two beds joined together lengthwise, weighs nearly 32 stone, and has 17-inch feet. His gargantuan palms measure more than a foot in diameter. Despite persistent attempts by the Guinness Book of Records to officially measure him over the last three years, Stadnyk had always refused until he met London growth expert, Professor Michael Besser. On examination, the specialist found to his surprise that the brain tumour which had haunted Stadnyk for more than 20 years had naturally died off - saving Stadnyk's life and finally halting his extraordinary growth spurt. 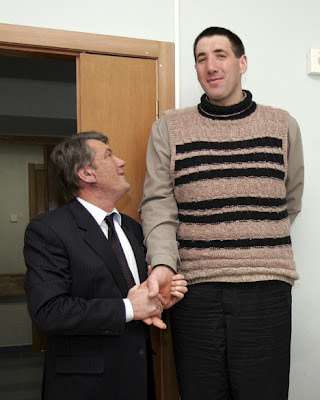 It was Professor Besser's discovery - filmed for a documentary on the Discovery Channel in December last year- that led to the emergence of his true height after it was measured officially in Kiev. Now he has been added to the record books in America, although the 2008 Guinness Book of Records won't be published in the UK until September 28 this year. The former veterinarian, now lives with his mother in a cramped three-room, one-storey house in northwestern Ukraine where he has to contort his frame to get in the doorway. Stadnyk spends his days taking care of the family's house, cows and pigs, gardening and looking after a tiny pet parakeet. Although he was once able to work on a cattle farm, he had to quit six years ago after his feet became frostbitten because he couldn't able afford to buy a pair of specially made size 27 shoes which cost £98 - the equivalent of seven months' worth of his pension- for his gigantic feet. Professor Besser, from the London Clinic Centre for Endocrinology said: "He doesn't want to be famous. He lives like a hermit and he says he has done nothing to court fame and wants nothing to do with the Guinness Book of Records. "His recovery from the tumour has been remarkable." 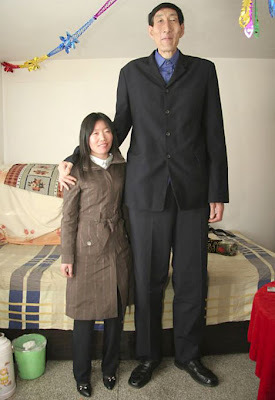 The former record holder was Mongolian Bao Xishun who was measured at 7 ft 8.95 in on January 15 2005 at Chifeng City Hospital, Inner Mongolia, China. The UK's tallest man is Neil Fingleton, who was measured at 7ft 7.56ins at the Guinness World Records offices on January 29 2007. The tallest ever man was American Robert Pershing Wadlow, who was born in Alton, Illinois on 22 February 1918 and was last measured at 8ft 11.1in tall on 27 June 1940.